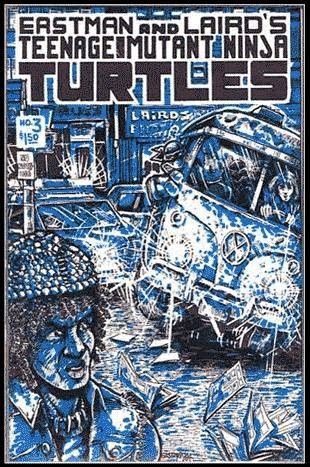 The Turtles and April emerge from a storm drain at a construction site to part ways. April thanks them for everything, but says that she’s worried. Once the police learn about Baxter from her, they’re going to be crawling all over the sewer. She gives them her address in case they need a place to lay low for a while and bids them farewell. The Turtles return to their sewer lair, only to find the joint broken into. Inside, they’re met with a horrible surprise: the remains of several mousers and the signs of a very violent struggle, but no Master Splinter. Raphael is furious and wants to find Splinter immediately. Leonardo stops him and tries to keep everyone’s heads cool. Barking orders, he tells Raph and Michelangelo to help him gather their stuff while Donatello keeps an eye out for Police. Raph refuses and runs off in search of Splinter. They decide to let him go and continue on with Leo’s plan. Later, in an alley, the Turtles remark that they made it out of their lair right before it was besieged by cops and workmen. Leo is furious that Raph is nowhere in sight, only to have the missing brother appear over a fence. Raph apologizes for running off and says he found no sign of Splinter. Leo says they’ll continue the search later, but first they need to call April for help. From a payphone, they call April and ask if she can pick them up. She rushes out in her rusty Volkswagen and the Turtles pile in, filling April in on the bad news as they take off. As they pass a car full of cops, one of the officers remarks that April’s van fits the description of a bank robber’s getaway vehicle and begins pursuit. The Turtles, not wanting to be found, tell April to step on it as Mike snatches the license plate off the back before the cops can get the numbers down. A car chase ensues as April cuts through Central Park, narrowly avoiding pedestrians as the cops struggle to follow. They lose their tail, but as they exit the park, another cop car spots them and tries to run them off the road. They manage to maneuver the cop through the window of a store. As they make a turn, by sheer coincidence, they happen to pass the Volkswagen being driven by Rico and Slim, the bank robbers the cops are after. April bumps into the van, knocking it over. 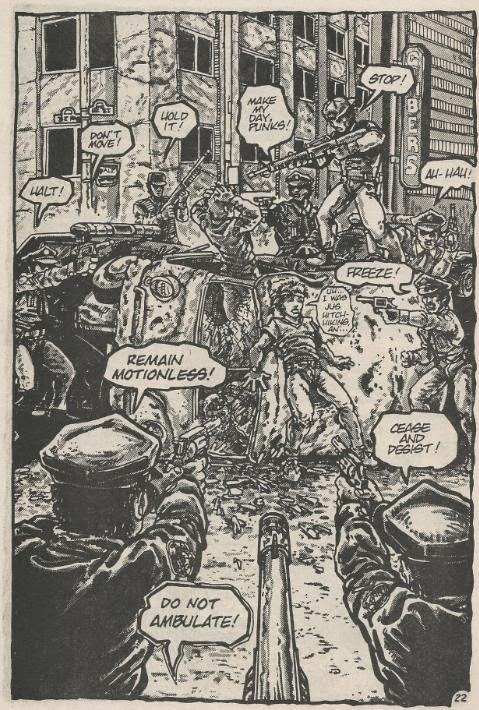 The cops swarm the tipped van containing the criminals as April and the Turtles escape. A small army of police officers order the criminals to remain motionless under no uncertain terms. April takes them back to the Second Time Around antique store she’s been running ever since her father had a stroke and had to go live in a nursing home. She lives in an apartment above the store and is the only person in the building, giving the Turtles the privacy they need. The Turtles settle in as April goes to get them some beer (what part of “Teenage Mutant Ninja Turtles” did she not understand?). When she returns, the guys are all out cold. She fetches them some blankets, thinking about how wacky her life has become over the past few days. Epilogue: Somewhere in the sewer, an injured Splinter awakens. Dizzily, he recalls what happened. While he was reading in the lair, several mousers chewed through the entrance and attacked. Battling his way out into the tunnels, he was approached by even more of the robots. The mousers were too much for him, taking bites out of his flesh. Splinter surrendered to his fate, only to have the mousers turn around and walk away as he passed out. Returning to the present, Splinter collapses again. Suddenly, a pair of workers for a company called “TCRI” enter the tunnel, complaining about how much they hate cleaning the storm drains in the sewer, though they’re pleased that Baxter Stockman’s plan was a failure. 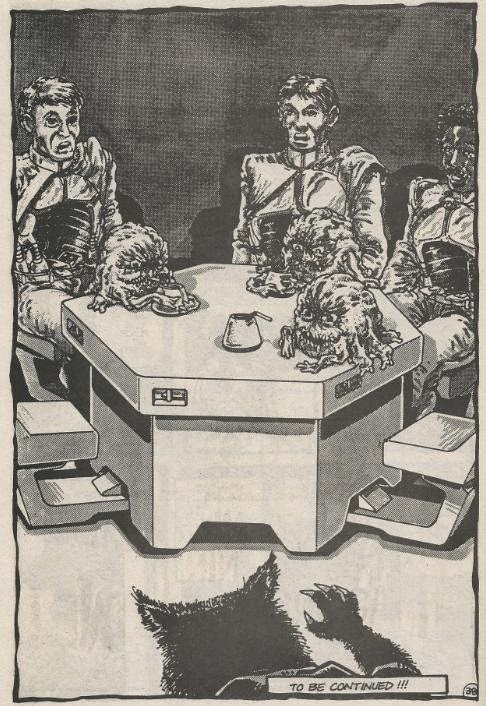 They happen upon Splinter and decide to put the rat out of its misery with a weird sci-fi gun. Splinter begs them not to shoot as he falls asleep. The workers decide he is an unusual specimen and lift him up, intending to take him to the infirmary. Later, at the TCRI building, the employees remark (rather unenthusiastically), that Splinter will make a full recovery. They then leave to get out of their uncomfortable "suits". Splinter awakens in the infirmary and, fearing capture, tries to sneak out. Passing a door he sees a terrifying sight: three weird octopus monsters exiting three cybernetic human “suits” and drinking beverages. *This story is continued from TMNT (Vol. 1) #2. The story continues in Raphael (microseries) #1. *The sewer lair will be revisited in TMNT (Vol. 1) #19. *The second printing of this comic (November, 1988) featured a new cover by Peter Laird and Jim Lawson, redone lettering by Steve Lavigne, a bonus pin-up by Bernie Shuman and a new back-up story, “Complete Carnage an’ Radical”. *For the color TPB, TMNT Book II published by First Comics, the epilogue to this issue was changed to a prologue for TMNT (Vol. 1) #4 (this issue having actually been collected in their TMNT Book I TPB). You want to know the truth? When I first became aware that the Mirage TMNT comic existed way back in the day, I actually thought it was only a four issue miniseries that ended with the Turtles getting teleported to another planet. I’m not really sure why I thought that. Maybe some price guide I was looking through was terribly incomplete. Maybe the back issue bins at my shop never seemed to get issues past #4. Maybe some website at the dawn of the internet only covered through issue four in their summaries. I really don’t know. But even when I thought there were only four issues to this whole series… I still thought that issue #3 was the most boring one. For all the major plot threads issue #3 initiates (the Turtles living with April, Splinter getting abducted by TCRI), the bulk of the comic is pretty much pointless. The entire car chase has no bearing to anything going on in the narrative and is just some unnecessary action for the sake of action that hinders on two ridiculous coincidences (one that gets them into the mess and one that conveniently gets them out of it). It served no purpose and, well, I’m sorry, but it just doesn’t look very good. Car chases are an incredibly hard thing to pull off in a comic book as they require the illusion of breakneck speed and perilous hairpin turns. “Vrooom” sound effects and crude motion lines can only do so much. This issue also marks one of the only times I’ve read an original Eastman/Laird penciled issue and actually noticed, without making an effort to notice, when the artists changed between pages. 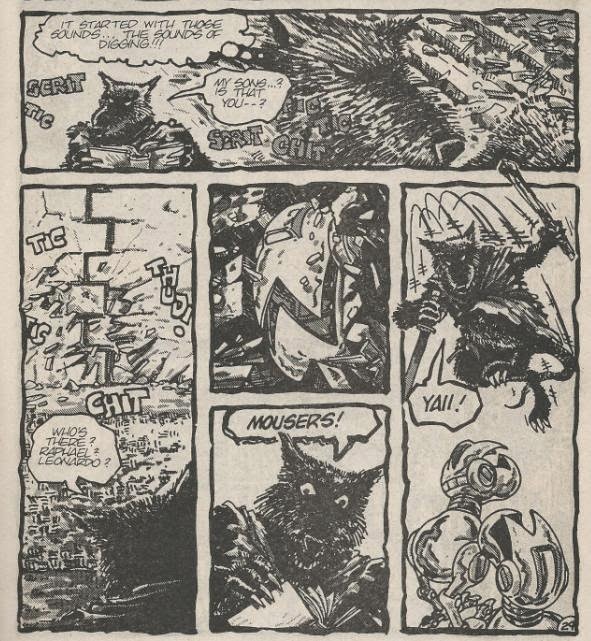 Eastman and Laird were typically pretty good about remaining stylistically consistent with each other so that readers wouldn’t immediately be able to tell who did what pages (their inking and toning each other’s pencils also helped in that regard). But with this issue, I was able to tell when Laird was drawing April and when Eastman was drawing April and it seemed a tad distracting as her facial model would change slightly between pages. Laird drew her with a rounder face with more defined facial lines, giving her something of an ugly masculine look (observe page 14). Eastman, meanwhile, drew her with less “wrinkles” and a far “cuter” countenance (observe page 25). They also shape her eyes differently, which is sort of a dead giveaway. It's also a tad rough in the way of characterization. 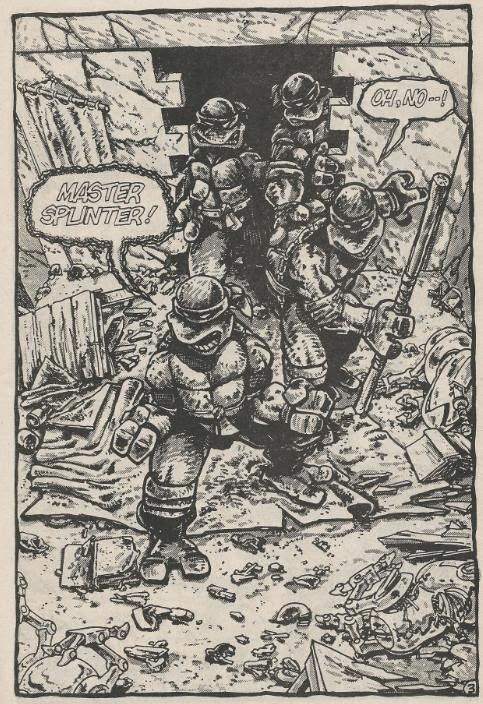 Splinter sure makes a lot of goofy quips as he fights the mousers ("Try biting someone your own size! ", "Speak of the Devil, I'd better hustle..."). And most of the Turtles still have yet to develop any personality (aside from Leo being Cyclops and Raph being Wolverine, anyway). Characterization is something the book grows into over a while, though these early issues can be a tad off-putting to some as everyone either acts so strangely or does nothing of interest whatsoever. I don’t dislike this issue, if that’s how I’m coming off. There aren’t very many issues of the original Eastman/Laird run that I do actively dislike (at worst, I’m just ambivalent toward some). As I mentioned earlier, it introduces a lot of major plot threads that would run through the series, at least when it wasn’t wasting time with that silly car chase. Though I’m not the biggest fan of the Utroms, that last page cliffhanger was a doozy and a great moment in Turtles history. I’m also rather fond of the initial “living with April” era of the series, as it seems the most like the “prime” era of the Mirage Turtles’ lives, when things were more carefree and “fun”. It’s the Turtles equivalent of “Peter Parker in high school, living with Aunt May”; that nostalgic era we all remember best about the Turtles, when things weren’t so bogged down in continuity and everyone was just a little happier. Overall, I suppose this qualifies as a “breather” issue (if I call it a “filler” issue, Laird will mail me a pipe bomb). It’s a break in the action to give the characters a chance to relax before hitting their next adventure. Of course, being the Turtles, the most relaxing “break in the action” they’ll ever get is a ridiculous car chase. Issue #3 of the series is a bit of an oddity, as a lot of stuff happens without a lot of stuff happening. Is it just me, or does April look like 3 completely different people in issues 2, 3, and 4? Her evolving hair style just changes her appearance drastically. Personally, I'm glad the Fred Wolf cartoon stuck closest to her original appearance. The other two styles look real generic to me. At least she finally got away from that fro' by Volume 2. Not sure how to ask this without sounding like a tool, but here goes: is it just me, or does April appear decidedly non-Caucasian in her first couple appearances? Not that that's a big deal or anything (Mirage April has undergone more facelifts over the years than James Bond). Actually, that question has been posed before. I'll see if I can find the interview, but both Laird and Eastman have weighed in on it. If I recall correctly, Eastman said that he was dating a black woman at the time of TMNT #2 and snuck some of her physical characteristics into April. Laird, upon hearing that, said he wasn't sure how truthful Eastman was being, and that so far as *he* knew, April was meant to be an Irish-American caucassian from Day One. At times she looked like she might be biracial (though I might just be saying that because she bears a downright eerie similarity to an old friend of mine on the v1 #11 cover). On the flip side, in some of Lawson's early efforts--Tales, and even some panels of C@W--she looks like a cross between Sigourney Weaver and Cher!